It's winter, and all of our body parts are contracted -- our shoulders, our faces, our feet, and our hips! One of the best kinds of yoga stretches to do in winter is hip opening poses. They go deep into your hips, working the band of nerves that start at your lower back, dive through your hip pocket, and twist into your inner thigh. 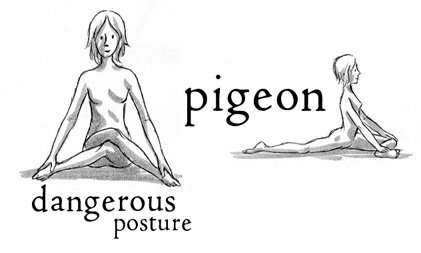 (referring to the formidable-looking pose) Start by kneeling on the floor, sitting on your heels. Take a few nice breaths. Then gently come onto all fours and cross one leg over the other, kind of like crossing your arms but with your legs. Sit back down. You should have your right foot by your left thigh and left foot by your right thigh. Place your hands on your feet and breathe deeply. To deepen the stretch, push your feet out and up on the floor to be level with your knees, then drape your upper body over your legs and relax for several breaths. Repeat with your other leg crossed overtop. Start by kneeling on the floor, sitting on your heels. Let that stretch work into your legs. Then gently come onto all fours and bring one knee between your hands, and stretch your other leg straight out behind you. Sit up straight, don't let your lower back curve in too much. To deepen the stretch, bring your foot up to be level with your knee, forming a "bar" between your hands. Bring your upper body down to the floor and rest your forehead on your hands. Breathe deeply, feeling your tight hips loosen with each breath. Repeat with the other knee forward. p.s. I've seen "dangerous posture" called "cow face posture" in some sources, but in fact this seated pose with the legs crossed is "dangerous" (also lovingly nicknamed the "nutcracker" by some men), while "cow face" is a seated shoulder stretch. I will spotlight cow face posture in the near future, it's a really delicious stretch.